In his 1798 book “An Essay on the Principle of Population,” Thomas Malthus predicted that population growth would outpace our food supply leading to food insecurity and even starvation for many. While he couldn’t have known the impact that technology would ultimately have on agriculture and our global food supply, he was correct in assuming that there would be daunting challenges to sustainably feeding a growing planet. Farmers and food producers battle a number of challenges daily - from managing the costs of food production to tackling climate change and trade concerns. Technology has already helped agricultural businesses improve their yield, the hardiness of their crops, and to improve nutritional density in the foods produced. With a projected world population growth from 7.6 billion to 9 billion projected by 2050, there is still much to be done to increase our food supply in the face of so many issues. In this article, we are going to look at three key areas where artificial intelligence, robotics, machine learning, and computer vision are being utilized to revolutionize the agriculture industry. In order to meet the need for higher food demand, farmers and food producers must find efficiencies in their processes. They must automate tasks and increase their yield. The Small Robot Company is working to do just that by implementing small field robots that map the land, and in time will help with planting crops, caring for them, weeding, and ultimately, harvesting. Their hope is that by automating menial tasks, and by leveraging data around farming, that yield will increase, while the cost of production will decrease, thereby reducing food costs and making nutritious food more widely available for all. California startup Iron Ox is a fully autonomous indoor hydroponic farm that utilizes robots in nearly every part of its farming process. They refer to their approach as human-led, robotics-first. Their system uses 90% less water over traditional farming while growing more than 30 times the amount of crops per acre of land. They are also able to eliminate seasonal scarcity of some products as they can grow seasonal varietals year-round. The robots at Iron Ox adjusts spacing, light, and fertilizer as plants shift from one point in their life cycle to the next ensuring that plants never go to waste. 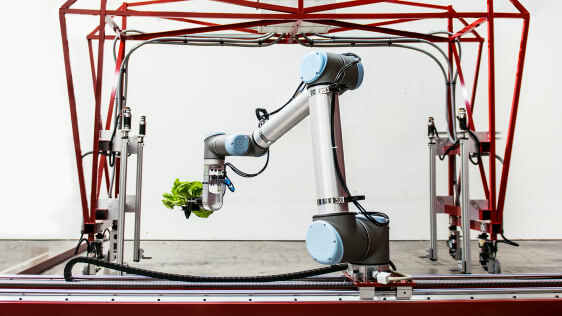 The algorithms behind the robots will also optimize where and when foods are grown and delivered to maximize the life and freshness of the food. Historically, the grading of fruits and vegetables has been a largely manual process - a conveyor belt of fruits and vegetables, a row of human monitors and plenty of opportunities for inaccuracy. New computer vision technologies promise to automate the process of fruit and vegetable by scanning the produce and then giving an accurate assessment of the quality and condition of the fruit. Machine learning software paired with these computer vision tools will then predict which produce items will last longer, and therefore could be shipped farther away for sale. For plant breeders and crop developers, deep learning - a subset of machine learning - is quickly becoming a powerful tool to help them develop plants that will better serve our ever-changing needs. Scientists and plant breeders can leverage genomic data and field data, analyzing it with a deep learning algorithm that can help them to quickly draw conclusions about a plant’s genes and the likely traits they will produce. Run simulations that will predict a plant’s response to soil conditions, sub climates, weather, and other factors. Identify factors that may lead to crop famine, and to advise how to avoid such issues. At Positronic, we work with visionaries to help them develop technologies that achieve their goals. From automating business processes to leveraging your data to make more powerful predictions, we can help you develop the tools you need to succeed. Considering developing an AI or Machine-Learning based tool for your agriculture-based business? Work with our team to build your tool. Click here to contact us and learn more.